Google are currently running an Android Pay promotion in the UK for the festive season. Every time you use Android Pay this month (December 2016), you get a chance of winning a prize [archive]. The first five times, you also get a coin. And five coins gives you a £3 Costa gift card. It looked like my £3 gift card was on the verge of a descent into a deep abyss, but I had observed that the URL ended with another URL. I stripped off the https://pay.app-alt.goo.gl/?link= part of the URL, opening the remaining part starting with https://www.android.com, and to my relief a page inviting me to claim my £3 gift card appeared. 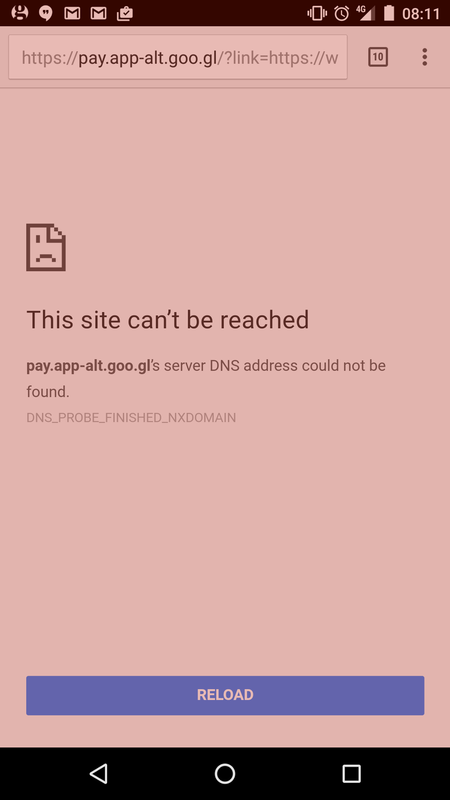 In other words, pay.app-alt.goo.gl was just some kind of redirect server which wasn't even needed. An absurd situation, which many would struggle to get themselves out of by themselves. Peculiarly, I didn't find any other references to the problem from some quick searches online, so whether I'm the only one to encounter this problem I don't know.